In preparation for EuroBike, we have been selecting which bikes to have in the EDGE/ IF Bikes stand. There were two obvious bikes that would make it into the show, the new Corvid and the Rapha Continental SSR. 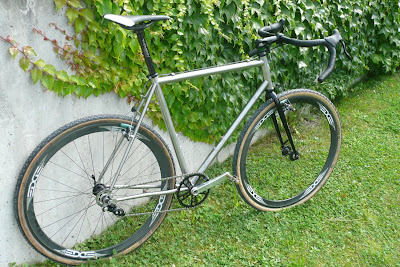 Joe's sick sub 9kg Ti Deluxe seemed like another great candidate, so it came down to a toss up between a cyclocross bike and a 29er. Being that the media has finally picked up on the 29er thing, and the EU manufactures as well (I have had a few ask me about sales, performance and geometry), I figured everyone would have one intheir stand this year. Rather than just showing them, we are taking a few to the outdoor demo day on Tuesday (Jeff and Chris D are bringing a couple of Cielo 29er with - curious to see those). So I decided to refurb my 2 year old SSX for the show. Many riany rides, mud and trails left the once brilliant brushed finish a little dull, so armed with buffing pads from IF I went to work. It did not take long to bring back the luster of the fine brushed finish and in about an hour, the frame looked like new. Another reason I love this material. 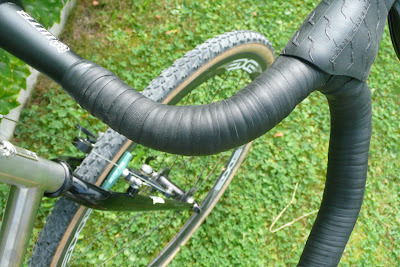 The ride quality is in my opinion better than any other material out there, it is stiff yet smooth on the trails. Scratch, dent and corrision resistant, I do not understand why you would want anything else, really. Then the fact with a just a little love, your bike can look like new again. OK, off the soapbox. The bike is heading out for a paint job featuring our new logos to match our soon to be released website and promo materials (not too mention the custom made Dugasts with our logo on them). Can't wait. Besides we are trying to relight the fire of cyclocross here in Germany. You would figure a land that has won World Titles would have more of a scene, but it seems the Germans have a short attention span (think Schummi or Ullrich). If they are not winning (but they are with Hanka), then they are not interested it seems. Fortunately this stereo type does not hold water with small sub-cultures like that in Leipzig, Dresden and other communities where we would like to tap into that passion and build a cross scene. I also built up Marco's SSX, since his wheels were absent, mine dutifully stepped in and looked good in the process. 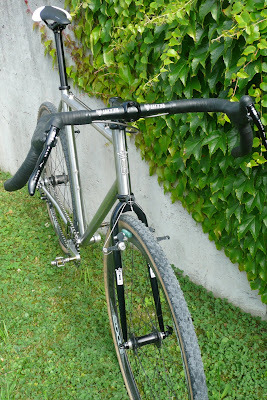 His bike built up super nice, and the HandleBra is the nicest bar tape I have used. Its musty, rustic smell reminded me of my old local shop back in Iowa, the Cyclery which was in a basement and full of old leather helmets, shoes, saddles and so on. The tape wrapped effortlessly with superb results. It felt great in the hand and looks stunning. We are also carrying this product in our line going forward and look forward to putting this on some more bikes. Time to build some demo bikes and go for a Sunday ride.